I haven't checked this site in a while, and lately I've been thinking that I need to change the title "Another Coffee Cup." Does it really fit? After checking the stats of how people visit this site, I mostly find that people come across it after puting "coffee cup curtains" or "coffee cups" on the Google or Yahoo search engines. I mean, honestly, coffee cup curtains? Excuse my metrosexual tendencies, but why on earth would you get coffee cup curtains? At least that's not too strange. The strangest way someone found this site was through Yahoo France; somehow "American Couples + Arab man" brought someone to this site. 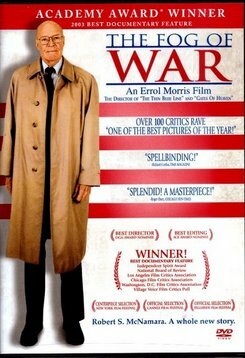 Recently I watched Errol Morris' documentary The Fog of War. The film, which won Best Documentary at the Oscars back in 2004, details the life and strategies of Robert McNamara, the U.S. Defense Secretary from 1961 to 1968. The film chronicles his life, from his earliest memories, to his role in the Army Air Force in the Second World War, the Cuban Missile Crisis, and ultimately Vietnam. McNamara (which is actually pronounced MAC-namara) relates his experiences and opinions directly to the camera, whether it be meeting his future wife, or remembering Curtis LeMay's insistence on destroying Cuba even after the end of the 1962 Cuban crisis, to his admission that had the Allies lost the Second War, he and his fellow officers involved in the fire bombings of Japan would be considered war criminals. At the end of the documentary, I had to pick my jaw off from the floor. McNamara, who's now in his late eighties, is still very much in command of knowledge and up to date with current world politics. One point which never left me after watching the film was his belief about how the U.S. and the Soviet Union averted nuclear destruction in 1962. We had empathy for the Soviet Union--not sympathy--but empathy: the ability to put one's feet into the enemy's shoes. Because we had some knowledge of how the Soviet leadership felt, we could seriously ask ourselves "what would they do?" By doing so, and with sure luck, we averted a war. Both sides operated on the same superpower soundtrack. With Vietnam, according to McNamara, we didn't express empathy. Instead, the U.S. operated on the Domino Theory; the belief that communism was spreading from country to country like dominoes falling onto each other. The Vietnamese, on the other hand, didn't see it that way; instead, they viewed the Americans as the next imperial colonial power, replacing the French in quelling their independence. No matter how many American bombs and chemicals fell on Vietnamese jungles and villages, according to their former foreign minister, they would never surrender. The Americans, oblivious to the history and culture regarding the conflict, only magnified the problems due to their distinctly different approach over how to fight a war, one which McNamara was a participant. Whether you agree with McNamara's ideas or not, the end result is downright thought-provoking. In all a great, fascinating film. Probably one of the best documentaries I've ever seen.